Dr. Lattie Coor founded the Center for the Future of Arizona in 2002 with the goal of creating an Arizona in which there are opportunities and quality of life for all citizens, now and in the future. Under his direction, the center has focused upon collaborative initiatives such as creating a unified state vision and action plan, and implementing the Beat the Odds research findings in Arizona K-12 schools. He also is the Ernest W. McFarland Arizona Heritage Chair in Leadership and Public Policy and a professor of public affairs at Arizona State University. 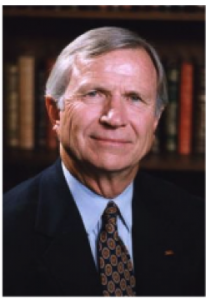 Dr. Coor is a highly regarded Arizona statesman and esteemed president emeritus of Arizona State University (1990-2002) and the University of Vermont (1976-1989). As president of ASU, Dr. Coor elevated the university’s status as a major research institution with high-quality academics and a diverse student body.